Since the ingredients in this pear salad are so delicious, a simple lemon and rice vinegar dressing work best; a heavy dressing would mask the flavors. 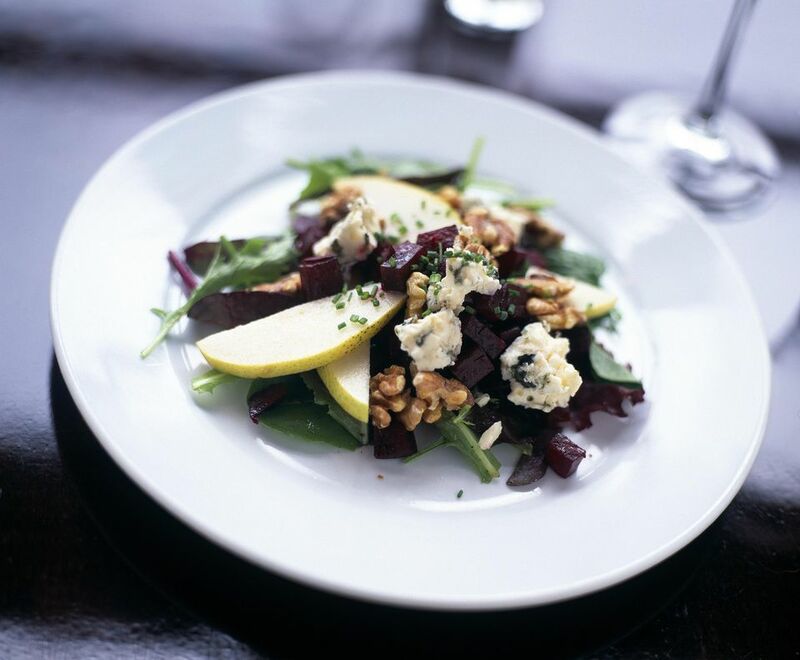 This pear salad can also be served without the cheese on top and would be a delicious but even lighter first course. You can use almost any lettuce for this pear salad. Pick what you like best, anything from a spicy arugula or watercress to a mild butter lettuce. The same goes for the pears: Bosc, Bartlett, Anjou or Comice would all be great choices. Divide the lettuce onto four chilled plates and top with sliced pears and currants or raisins. Crumble the cheese evenly over the salads and top with walnut halves. In a small bowl combine the lemon juice, rice vinegar, and olive oil. Whisk together and season with salt and fresh-ground black pepper to taste. Drizzle half over the salads and serve the rest on the side. Serve pear salad when the fruit is seasonal, from late summer, when the Bartletts start to appear in the grocery, then the Boscs and Comices, to wintertime, when the Anjous are at their peak. Roasted chicken with rice pilaf or roasted sweet potatoes, fresh seasoned green beans and French bread. Serve with a dry white wine like chardonnay, pinot grigio, Albarino, or sauvignon blanc. Baked ham with broccoli and cheese casserole and fresh sourdough bread. Choosing a wine to complement ham is not as easy as with chicken or beef. Go for something a little bit sweeter, like Riesling, Chenin blanc, rose or Muscato. Sparkling wine also makes a good pairing for salty, smoky ham. Grilled salmon, basmati rice with sauteed mushrooms and green onions and artisan bread. Grilled salmon can handle a bolder wine than most seafood, and pinot noir and rose are both good choices. If you prefer white, try a pinot gris. Charcoal-grilled rib-eye steaks, garlic toast and baked potato for a classic meal. Wine with steak has to be a big, bold red. Best bets are malbec, cabernet sauvignon, zinfandel, merlot or blends made with cabernet sauvignon.